Rooter Right has Sump Pump Solutions for the needs of every Home and Business. We Install New Sump Pumps, Water-Driven Back-up Systems, Battery Back-up Systems, additional Sump Crocks, and Alarms of all kinds. Schedule a Consultation Today to see what options best fit your needs. Protect your home or business with a Quality System designed and Installed by the Professionals at Rooter Right Plumbing & Drain. Sump Pumps are a crucial part of maintaining the overall health and longevity of your home. Although water is a crucial amenity in our homes and businesses, under the right circumstances, water can be extremely destructive. Keep water in check and keep your building dry with regular maintenance of your Sump Crock Equipment. Water damage in the home can be quite costly, and basement flooding is often a separate policy within your homeowners insurance that many people do not have. The assumption is that because you have homeowners insurance your flooded basement is covered; this is a common misconception that can leave you footing the bill for the water extraction, drying, and restoration of your basement. This can be an exceptionally large cost, especially if your basement is fully finished. A Quality Sump Pump Installed by a Professional can save a lot of money and a lot of headache. Choosing the right Sump Pump is key when designing your system. We install many different sizes and styles but the one thing that stays consistent throughout each installation is the quality of the products we provide. Also important to your peace of mind and the preservation of your basement is a Sump Pump Back-Up System. We offer a number of solutions to fit the needs of every Residential and Commercial Client. 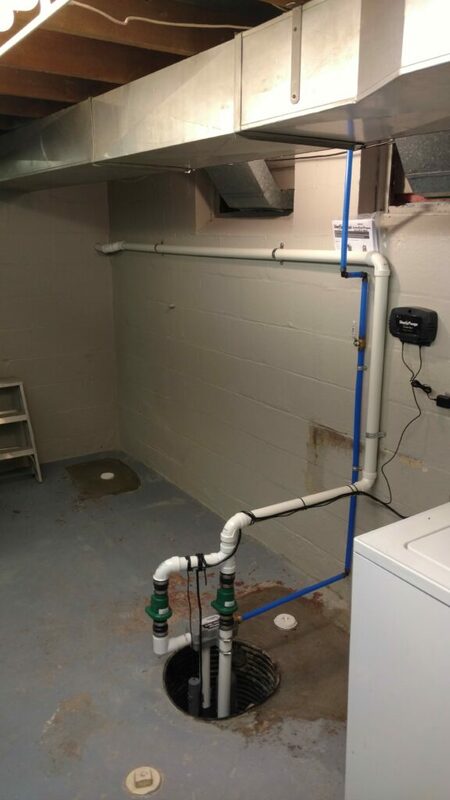 Sump Pump Back-Up Systems play a pivotal part of keeping your basement or crawl space from flooding and potentially damaging the structure of the building, as well as, major appliances such as your furnace, water heater, and laundry machines. Unfortunately, sump pumps do not last forever. The life span of your pump can depend on many factors like: the quality of the pump, how often it cycles, the depth of your basement, the height of the water table, where you live, rain events, the thawing of snow and ice, and even things like the amount of iron in the ground water. Either way, at some point, your sump pump will fail. The damage that occurs due to pump failure depends on how quickly you can restore pumping ability. With a back-up system, the ability to pump excess water is immediately taken over by your back-up unit. There are a number of different back-up systems with varying features to accommodate your specific needs. In most cases, our recommendation would be a “Water-Fed” or “Water-Driven” Back-Up Pump. Refer to section below to read more about Water-Fed Back-Up Systems. The Water-Fed Back Up System is a simple but effective way to maintain pumping capability at all times. It connects directly into the water supply lines in your home or business, being fed with a ¾ inch pipe. 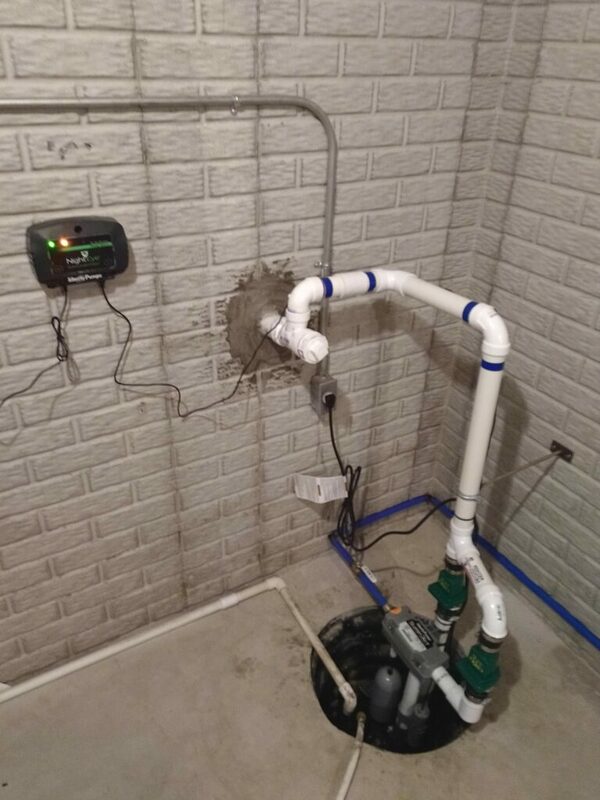 The system uses water pressure from the building to spin an impeller that draws water up into the unit and pushes it out through your Sump Pump discharge line. The unit is self-sufficient requiring no action from the owner to engage or start the pumping process. When your Primary Sump Pump fails, the water level rises in your crock to a height, that under normal circumstances, it would not reach. When it reaches high enough to lift the float on the back-up system, it triggers the pumping process, sort of like an “on switch”. 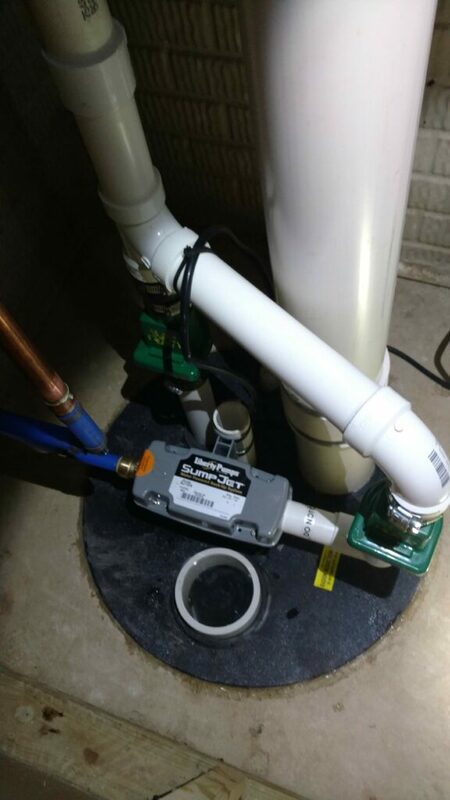 Anytime the water level in your sump crock reaches a certain height it is activated, it then proceeds to pump the water out, lowering the water level in the crock to a determined height at which point it turns itself off. As long as the water is on to the unit, it stays pumping. The fact that the water level is being maintained in your crock gives you ample time to replace your primary Sump Pump. This feature is also very beneficial during power outages. The “Water-Fed”/ “Water-Driven” back-up system requires absolutely No Electricity, meaning the power could go out for days and the pump will still continue doing its job, preventing you from flooding. These systems are great for peace of mind and when coupled with an Alarm System, greatly reduce the risk of your Basement Flooding. Sump Pump Alarms are a great tool in keeping you aware of what’s going on with your pump. Who has the time to check up on the old sump pump twice a day? I think we would be hard pressed to find folks that check on there pump weekly, it’s just something we often don’t consider until it’s too late and something has gone wrong. An alarm is a great way to have a “watch dog” for your sump crock without interfering in your daily life and schedule. There are different kinds of alarms to suit different needs. Your basic alarm will activate when the water level reaches a certain height that is higher than that of normal circumstances, when it does, you will hear a loud buzzing or beeping sound to alert you that there is a problem. Some alarms connect directly to your home security system. When the alarm is triggered, your security key pads chirp, and in some cases, the security company will even call you and let you know that your sump alarm has been activated. “Water-Fed” back-up alarms let you know when your back-up system is doing the pumping rather than your primary sump pump. This is important because unless you are regularly checking on your sump crock equipment, you may not notice that your sump pump has failed and your back-up has taken over. This oversight can lead to a high water bill due to the fact that your crock is being maintained with water pressure rather than electric power. The alarm lets you know it’s time to change the primary pump without flooding your basement or crawl space. The Liberty Night Eye System is the latest in Back-up System technology. It combines a “Water-Fed” back-up system, with an alarm system that is connected directly to you via your phone, computer, or tablet. The Night Eye alarm system connects to the Wifi in your home or business so you as the owner can check up on your sump system from anywhere. If the alarm is tripped and the pumping duties are taken over by the “Water Fed” Back-up System you receive a notification directly to your phone, computer, or tablet. Once notified you can open the Night Eye App and perform a system check for an update. You can see whether the power in the building or home is out, if the back-up system is performing its duty, and many other things. You will also receive notifications if the Wifi has become disconnected, if the power source has become disconnected, or if the alarm is running on battery back-up. This system is great for people who travel often, or have a lot of money invested in their basement living areas. The Night Eye offers the ultimate protection against flooding and can keep you up to date constantly on the status of your pumping system so you can always be one step ahead in protecting your home against flooding.